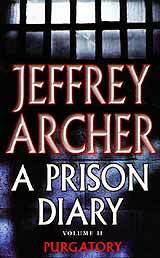 This book is the second in the trilogy of Lord Jeffrey Archer’s books written about his experiences while incarcerated, following his conviction for perjury, for which he received a four year sentence. The first of the trilogy came from his diaries written during the first 21 days of his sentence in Belmarsh prison. That was Volume I. The reviewed book, which was sent directly from Asia Books, was published in 2003 and re-released as a Pan Books edition in 2004, ISBN 0-330-41884-X, and relates to his 67 days spent in the Wayland prison and is entitled ‘Wayland: Purgatory’. For someone who has never seen the inside of a prison, other than in movies, Archer’s description is very insightful, showing the de-humanization that can occur, especially for those people without a strong grip on their self-worth. Archer, of course, does have a very strong grip! However, there is also description of what life ‘inside’ can do to destroy the very spirit in mankind, and also how the long-stay prisoner is disadvantaged in trying to begin life ‘outside’ again. He describes a long-stay who walked out at the end of his sentence and his release from custody with his nine plastic bags, his entire worldly belongings - and nobody came to pick him up. He had to be taken back inside to be given shelter for another night. Archer also highlights some of the rigid institutional thinking that is the norm in correctional facilities. However, similar to life in the armed services, it can be seen that in most instances, this is necessary, even though certain items seem very petty. Archer does give the impression that he believes he was unjustly dealt with, but then, I suppose we all would, given the circumstances! I enjoyed this book, not through any vicarious pleasure that a peer of the British realm had to spend time behind bars, but because of two main factors - the first being that this book shows a wonderful insight into the mind of the ‘man from the street’ and secondly because no matter what you may think of Lord Jeffrey Archer, the man can write! To be able to engender suspense in what is ostensibly a diary or journal is remarkable. But he does it. And this is in jail, where one imagines the chances of stimulating suspense would not be high. The man is a great storyteller (some claim he has been telling many stories about his life, for all of his life!). Understandably, Lord Archer managed to produce considerable outrage during his tenure in the British Houses of Parliament, spawning many websites attacking him, but at the same time has produced many books that are exceptionally popular. The popular press damns him, whilst the popular readers love him! At an RRP of B. 350, it’s a cheap read! The Shouting and Pointing Bit. Featuring ‘Shouting and Pointing’. After a successful nationwide tour of the British Isles, the boys from Mott spread their wings and journeyed over the Atlantic Ocean to try their luck with their American brothers, who had always given them such a fine welcome in their days when they had Hoople tagged onto their name. As expected, musical conquest was almost instant; although it was a little disappointing that their American agents did not have the confidence to put them into bigger concert halls rather than the small clubs they were asked to play. However, with increased sales of their debut album ‘Drive On’ they were soon moved up the pecking order by the record company and put on bigger and more prestigious gigs, supporting the likes of Kiss, Aerosmith, and Canadian prog rockers Rush. Things were on the up and up, and if anybody deserved it, this bunch of eccentric British musicians deserved every slice of luck that was coming their way, as they had certainly paid their rock ‘n’ roll dues over the years. So when Christmas and New Year 1975 loomed, it was decided to return home to Blighty for the festive season for rest and recreation, re-uniting with loved ones, and hopefully a bit of industrious writing to record the next album in January. So far so good. This time the onus was not solely on Overend Watts to write all the songs as various ideas had been worked by various members of the band whilst out on the road. Add to this the necessary recording and road time that had been spent to let the new guys, Ray Major on lead guitar and Nigel (the Dome) Benjamin, to feel like part of the band, and not like the ‘new guys’. So it was with great optimism that they returned to recording in February 1976, after further rehearsals. The prestigious Manor Studios in Oxford was booked and the great Eddie Kramer was moved in to do the major part of the production work. This time the band knew what they were going to record before they went into the studios. So when ‘Shouting and Pointing’ was released in June that year, it was an absolute corker. 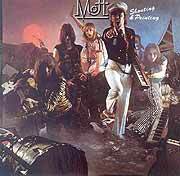 Even the artwork for the cover was of the highest standard with the band in full stage regalia, emerging from a futuristic rubbish dump - naturally ‘shouting and pointing’. The album was split into the two sides of the vinyl, side one ‘Shouting’ and side two ‘Pointing.’ The opening title track is an all time classic rallying call for futuristic Hot Motts, very similar in feel to the Who’s ‘Won’t Get Fooled Again’, only with Benjamin’s high pitch wail beseeching you to listen, while Morgan Fisher frantically pounds the piano as if his very soul depends upon it. A gut ripping solo from Ray Major hammers Mott’s intention to the mast. Of course, after all these years the rhythm section of Watts and Dale is never going to let you down. The whole album is a real party album with each new track breaking out from the speakers. All of them could be ripped up and roared out live in concert. Mott even closed the album with the stage favorite, the old easy beats number ‘Good Times’ (after being deluged by request from fans for a recorded version). All this is witnessed by Angel Air’s posthumously released ‘Mott, Live - Over Here And Over There, 75/76.’ The only ballad on the album is a Benjamin/Fisher penned number entitled ‘Career (No Such Thing As Rock ‘n’ Roll)’, a song about the dangers of the business side of the music business. This, coupled with the fact that Overend Watts decided to take lead vocals on his own song ‘Hold On You’re Crazy’, was all rather prophetic. Although another U.K. tour followed by another visit to the States, they were moderately successful. The band felt that they were not making any further headway. The reasons for this was firmly put at the feet of the record company and the Dome, who was perhaps getting a little delusional in his own role in the band, wishing to take them off into some form of progressive rock storytelling band venture, when the rest of them just wanted to get out and rock. The record company, smelling a rat, backed off dramatically financially. In December it was announced that Nigel Benjamin had left Mott. A couple of new vocalists were tested, but without much enthusiasm. Mott was put to rest before the end of the year. A great shame to a band that had huge potential. Mind you, the arrival of Punk Rock didn’t help. But it took more than that to put these British lions down. Within six months all remaining four of the Mott’s had regrouped around John Fiddler, ex Medicine Head, to have another reach for the stars. However, that’s another story for another day. Get out there and do some ‘Shouting and Pointing’.